“She gave life and soul to her students, no matter what kind of student they were or what their background was.” These words were spoken by colleague Kellye Ratcliff at Patricia Cochran’s retirement reception in May 2016. Before joining the Ruston High School faculty, Ratcliff had practice taught under Patricia’s supervision some years earlier. Her memories of Patricia include “countless hours sitting at her kitchen table planning lessons and grading papers because we never had enough time in the school day to get it done.” Kellye Ratcliff’s description of “kitchen table hours” appropriately represents Patricia Brown Cochran’s long love of and dedication to math and teaching. “At school, she was not there just to teach; she was there to help you learn,” Zach Yates said. “She’d take time and help you through it. That’s why she was a lot of people’s favorite teacher,” said Yates, best friend of Patricia’s son Brandon and a constant shadow at the home Patricia shared with Carrol, her husband of 52 years, their son, and many students. Her legacy of caring and of being available to those who needed her is evident in one special way that will affect Tech students for decades to come. Friends of the late Patricia Brown Cochran have established a scholarship in her honor through the University Foundation. 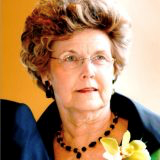 Patricia graduated from Louisiana Tech in 1962 with degrees in mathematics and education. She passed away in April 2018 after a 55-year career in which she taught two generations of math students. The Patricia Brown Cochran Scholarship annually will benefit a Tech student in Math Education and is the first major gift to support UTeachTech, the University’s pathway for STEM majors to become certified in secondary education. A non-endowed scholarship was originally set up several years ago by one of her lifelong friends. When Cochran passed away from multiple myeloma this spring, her many friends began working with each other and an anonymous donor, not only to endow the scholarship but also to elevate it beyond the amount needed for endowment. “She was a mainstay in my life, especially in her attempts at keeping me current with iPhones and computers,” said Nell Perryman Hayes, who lived with Cochran as a freshman on the second floor of Aswell. “She had entered Tech the summer before I did, and she helped me feel less intimidated.” Often during the summer, she tutored intimidated friends in the new technologies, for, she reasoned, those problems had ready solutions. “Her particular teaching talent was how she met students at their own level and never pre-judged their capacity for succeeding in math,” said Dot Watt Vinyard, her classmate and sister of Sarah Watt Brown, Cochran’s sister-in-law. “She withheld judgment and did the very best she could with every student she taught,” not an easy thing for a teacher to maintain over a long teaching career. Patricia’s love of teaching was grounded in her family environment. Patricia, born in October, 1941, and brother Bill, born four years later, were reared in Sarepta, by parents Ernest William Brown and Mattie Fay Boggs Brown, who both had gone to college (he at Tech and she at Northwestern) during the Depression before entering teaching careers. Ernest had come to Tech on a football scholarship and had roomed with John Ardis Cawthon, later to become head of secondary teacher education at Tech. The Cawthons—both Ardis and his wife Eleanor—were lifelong friends of the Browns, as was Ardis’s sister Annis, who taught math at Tech. Ernest Brown taught social sciences and math, was a football coach, and a principal; Mattie Brown taught elementary school before retiring after Patricia and Bill were born. Only she and her grandson Brandon, among generations of Browns and Cochrans, have degrees from schools other than Tech. With such a family background, Tricia Brown seemed primed for a career in education. Carrol and Tricia were high school sweethearts and dated throughout their years at Tech. However, they waited until August of 1965 to marry. While many of her generation married in high school or in the summer after college graduation, Tricia went from an early graduation at Tech to her first job in Texas because Texas teacher salaries were so much better than those offered by Louisiana schools. At her retirement, she was the longest serving teacher at Ruston High School; she’d taught developmental math and higher mathematics and, toward the end of her career, computer science. Her thorough style of teaching and grading and her principle of reasoning — getting inside the math minds of her students — required much at-home paper grading. A Ruston neighbor suffering from an illness resulting in sleepless nights said that she was often comforted by looking across the neighborhood and seeing the Cochran kitchen light on, knowing that Tricia, too, was awake grading papers. And then there was the tutoring. Both in the schoolroom and at home, Patricia was available for students having problems. Without pay, Patricia often would help students in after-hours math sessions. “Teaching was not an appendage,” a friend said; “it was integral with her life, even life after the school day.” Connie Howard, who lived next door to Patricia for many years, believes that her most distinct characteristic was her selflessness. Howard says that Tricia never complained, never boasted, never even spoke of these tasks that extended her work day. Patricia and Carrol were rewarded with grandchildren when Brandon and Audrey had sons Conrad and Carlyle. At Christmas, the last Christmas that she lived, Tricia went to extraordinary lengths to make it their best Christmas. She researched the boys’ gifts, making sure that they were both fun and stimulating. Planning those gifts was a challenge not too complex for a person who had dealt with generations of students attempting to think mathematically. The energy she put into family and friends and into improving the lives of her students still lives, both in the legacy of the scholarship that honors her and in the lives of the students she cared for.